Black and white image several gabled buildings, two with false fronts. Primary is a building with large double doors and a sign reading 'Blacksmith shop' on the front facade. A man identified in museum records as James Lincoln Loving, the proprietor, stands just outside the shop's large door. He wears work clothes, a newsboy-style cap, and a leather apron. Another man sits on a bench nearby; most likely a man named Sylvester Culver. Numerous wagon axles, frames, and wagon wheels are parked in front of the shop and leaning against various walls and fences. A fenced yard separates the blacksmith shop from another building with a door and two windows in the front facade and a sign indicating it is Jacobsen's Shoe and Harness Shop. A man and a boy stand on the front porch; the man may be I. Jacobson, the proprietor. 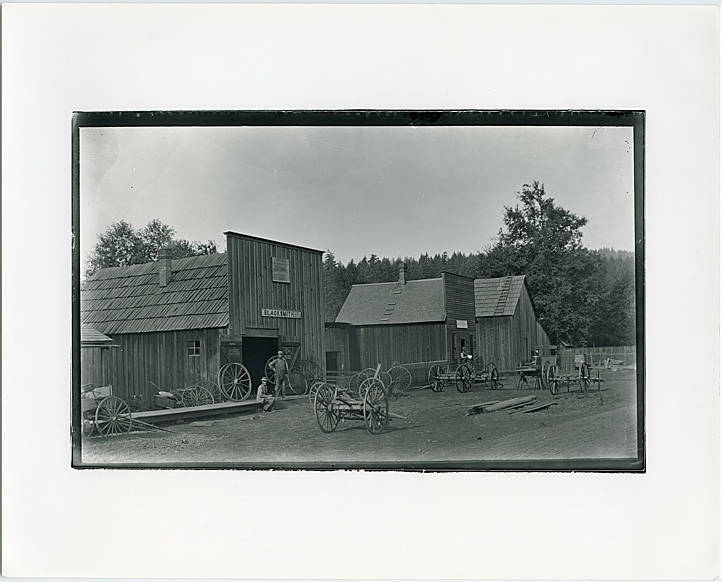 The third building in the image is the Berry & Dallas Prune Dryer, which dried apples, prunes, pears, pumpkins, and corn. [back] [typed] circa 1900. Gales Creek, Oregon. James (Jim) Lincoln Loving's Blacksmith shop. Next to it, the Shoe Shop of Ivers Jacobson; then the Berry & Dallas Prune Dryer. They dried apples, prunes, pears, pumpkins, and corn. Eula (Lafferty) Berkey (Jim's half sister) worked in the dryer; remembers cutting up pumpkin. J. L. Loving is standing in the Blacksmith Shop Doorway. The man sitting on the boardwalk is unidentified, but is probably Sylvester Culver. The man standing down the street is unidentified, but may be I. Jacobsen. Photographed by James Lincoln Loving. Reproduced from a glass plate by Rodney Aaron Wilson, [address redacted]. 30-Dec-85. 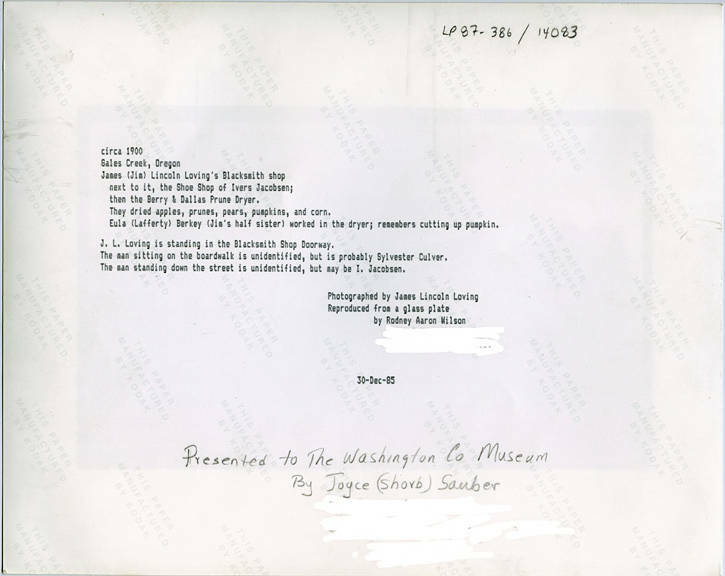 [pencil] Presented to the Washington Co. Museum by Joyce (Shorb) Sauber, [address redacted].